It’s a book about a street in Berlin, get it? 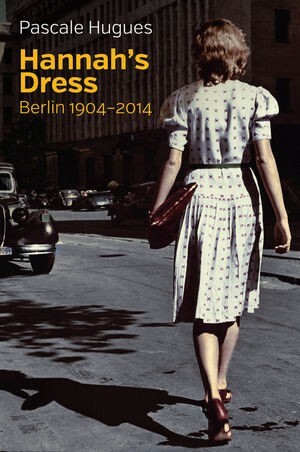 Hannah’s Dress tells the dizzying story of Berlin’s modern history. Curious to learn more about the city she has lived in for over twenty years, journalist Pascale Hugues investigates the lives of the men, women and children who have occupied her ordinary street during the course of the last century. We see the street being built in 1904 and the arrival of the first families of businessmen, lawyers, and bankers. We feel the humiliation of defeat in 1918, the effects of economic crisis, and the rise of Hitler s Nazi party. We tremble alongside Hannah and the Jewish families who experience the pain of exile or the horror of deportation. And we experience the hardships and anguish of those who remain — forced to make agonising choices under the constant fear of Allied bombing raids. In 1945 the street is all but destroyed, the handful of residents left want to forget the past altogether and start afresh. When the Berlin Wall goes up, the street becomes part of West Berlin and assumes a rather suburban identity, a home for all kinds of petite bourgeoisie, insulated from the radical spirit of 1968. However, this quickly changes in the 1970s with the arrival of its most famous resident, superstar David Bowie. Today, the street is as tranquil and prosperous as in the early days, belying a century of eventful, tumultuous history. The Bowie bit is a tad overdone, but that pretty much describes it. So: The idea of telling a story through the lives of the people on one street sounds a little gimmicky, and it is, but it also works pretty well here. The street itself, in the Schöneberg section of the city, sounds about as boring as any place adjacent to the front row of a century’s history could actually be, but what keeps the book interesting is Hugues’s conversations with its residents — most of whom who, in the first part of the book, happen to be Jews. As an American of a certain age and a certain background I was raised with a steady diet of Holocaust as part of my history curriculum, so I found it striking how moved I was by some of the stories here of those who were taken away and those who came back. It is either an example of how individual cases can be more affecting than sheer statistics or a good reminder that you need a refresher course every decade or so on how horrible the events of that era actually were, hopefully one that we will continue to only get from works of analysis and not any kind of 21st century reenactment. The book loses steam as it heads toward the present but not in an unpleasant way — more like, “history recedes and normal life resumes.” Eventually it is just a street, as any other, except it is filled with German people, and you know how they are. What else can I tell you? I am always dubious when people writing reviews refer to a book as “admirably translated,” as if they are native speakers of the original language and alert to the justeness of every mot, so I will say this one has a couple of issues with tense consistency but otherwise seems fine as far as I am aware. Okay? You should know by now if this is the sort of thing you would be into, and if you are I say go ahead. If you’d like a reading list of books about 20th century Germany to get you started please get in touch, but also maybe get a life.